Islamophobia and Trumpism are bringing disparate right-wing groups together. Kate Hurley stood on a street corner in Roseville, California, last Saturday with a giant American flag wrapped around her like a cape. The flag consumed her petite frame, its edges nearly touching the pavement below. The 52-year-old veterinarian and professor at University of California-Davis had recently bought it at Costco, with plans to mount it in her yard. She had never purchased an American flag before and never considered herself patriotic, but these times called for new measures, she said when I met her amongst a crowd of protesters. Saturday, she was wrapped in the flag to support Muslim Americans and immigrants and counteract a right-wing rally by an organization known for its anti-Islam views. “I want our narrative to own what this flag means,” Hurley told me. She was one of hundreds of demonstrators who had shown up with the nonprofit Indivisible, which was founded several months ago to push back against the policies of President Donald Trump. Counter-protesters like Hurley appeared to outnumber the group on the other side of Roseville’s busy intersection — part of 29 separate protests that took place across the country against the spread of Shariah, or Islamic law, in the U.S.
Several local cops stood on each street corner, keeping demonstrators apart. Cars zoomed by, honking in support of one side or the other. The right-wing crowd stood on the lawn outside BJ’s Restaurant & Brewhouse, holding signs decrying Islamic terrorism and watched over by self-styled militia members. The rallies were organized by an East Coast lobbying group called ACT for America. The event drew hundreds of people to Roseville — a town of 132,000 people, just northeast of Sacramento. Thousands more gathered in cities like Seattle, Denver and San Bernardino, helping mark a new American extremism, a far-right movement emboldened since the election of Trump and now coalescing in street demonstrations nationwide. No violence was reported in Roseville, but other cities saw scuffles between anti-Shariah demonstrators and liberal counter-protesters. Militia groups like the Oath Keepers, III% and American Civil Defense Association showed up; ACT had asked the Oath Keepers to provide security. Members of Identity Evropa, a recently formed white-nationalist group, and Proud Boys, whose ideology is steeped in male-supremacy, were also present. Saturday’s events may have been a meeting ground for an emerging movement, but the group that organized them, ACT, was founded in 2007 by prominent anti-Islam activist Brigitte Gabriel. An organizer with the group, Scott Presler, came up with the March Against Shariah idea after hearing about a Gays Against Shariah march in Manchester, England, also planned for last weekend. ACT for America, which calls itself “the NRA for national security,” claims over 1,000 chapters, though leadership at local outposts is obscure. Presler told me they are keeping names of local organizers secret for “security reasons.” ACT had 525,000 members as of last week — a number based on website signups. But this week, the website has been changed to say 750,000 members. One woman at the Roseville rally told me she was working with ACT to organize the event, but declined to give her name or more information about the group. Like Roseville, the Denver protests were mostly non-violent, though law enforcement intervened when fights appeared imminent. In San Bernardino, California, several pro-Trump demonstrators were arrested on suspicion of vandalism at a rally near the site of a 2015 terror attack. In Seattle, police used pepper spray to break up a crowd. The premise of these rallies was the opposition of Shariah, a set of Islamic ethical guidelines whose most extreme interpretations violate human rights. The ACT event was cast as a march for women’s rights, which participants say are curtailed by Shariah. Yet while demonstrators at the rally derided female genital mutilation and honor killings, no other traditionally feminist issues were apparent. Other protesters conflated Muslim immigration with extremist Islamic terrorism and the complex set of factors that feed it. “I do see what’s happening in the world,” the local ACT contact told me. “You go to an Ariana Grande concert and get blown to bits. That’s what I’m standing against,” she said, referring to a recent terror attack in the UK. Statistically speaking, the average American is more likely to be killed by cancer, a gun shot or animal attack. Yet legislators in 13 states this year have pushed bills to ban the use of foreign law in state courts, which critics say stoke Islamophobia. In February, state Rep. Eric Redman, of Kootenai County in northern Idaho, reintroduced an “anti-Shariah” bill, similar to one that failed in the state legislature last year. Montana Gov. Steve Bullock vetoed a similar bill in April. The number of explicitly anti-Muslim groups in the U.S. nearly tripled from 2015 to the end of 2016, to over 100 nationwide. The Southern Poverty Law Center also found that within five weeks of Trump’s election, of 1,100 “bias incidents” reported (which are acts motivated by prejudice), 37 percent referenced Trump or his campaign slogans. Just last month, Jeremy Christian, a man with white-supremacist leanings who had recently attended a “free-speech” rally of mostly Trump supporters, harassed two women, one of whom as wearing a hijab in Portland, Oregon, and then allegedly stabbed to death two intervening bystanders. Unity among individuals whose beliefs at times seem contradictory has become a hallmark of the emerging right-wing movement. Many demonstrators I spoke to last weekend seemed to oppose Shariah as a sort of side note. They came out first and foremost to show solidarity with the broader movement the event represented: the push for age-old conservative values from gun rights to states’ rights, in combination with the anti-immigrant nationalism that Trump espouses. An Oath Keeper from the San Francisco Bay Area told me his group didn’t actually “take a position” on Shariah. But he came to the rally anyway. Nathan Damigo founded Identity Evropa, a white supremacist group that recruits on university campuses nationwide. 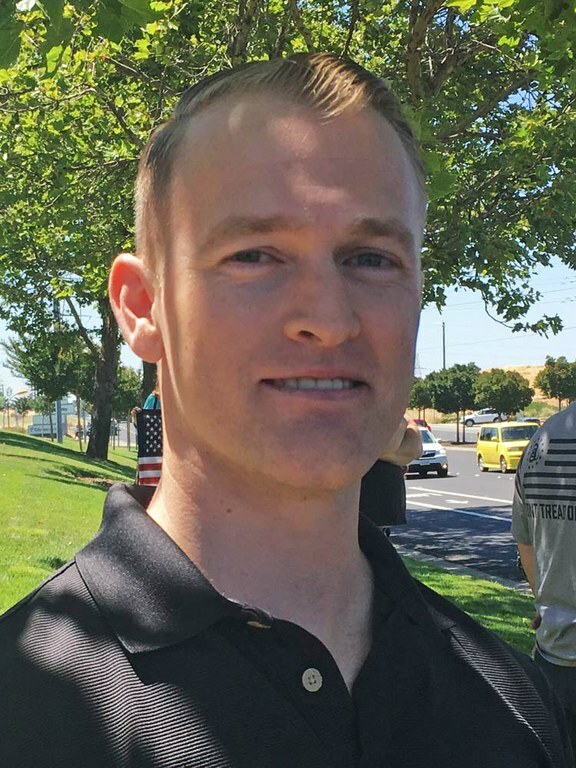 Damigo participated in the March Against Shariah in Roseville, California, on June 10. Spencer Sunshine, an associate fellow at Political Research Associates who has been following far-right movements for a decade, describes this new phenomenon as “Independent Trumpism.” “It unites neo-Nazis, members of the alt-right, Patriot movement paramilitaries and Trumpist Republicans,” Sunshine wrote for the daily news website of Race Forward, a national organization that supports racial justice. It has increased in visibility and violence through street protests. Kate Hurley, the veterinarian from UC-Davis, started taking to the streets after the presidential inauguration in January. “My mom was an activist, but I resisted it all my life,” she said. Hurley’s mother passed away a few years ago, but her spirit was at the rally: Hurley made a protest sign out of an old photo of the Statue of Liberty she found in her mom’s papers. She held it in one hand and a loudspeaker in the other. “This is what America stands for!” she yelled. Her American flag cape gleamed in the noon sun, stiff around her because it was still brand new. Note: This article has been updated to correct the probability that Americans are more likely to die from animal — not shark — attacks, than a terrorist attack.